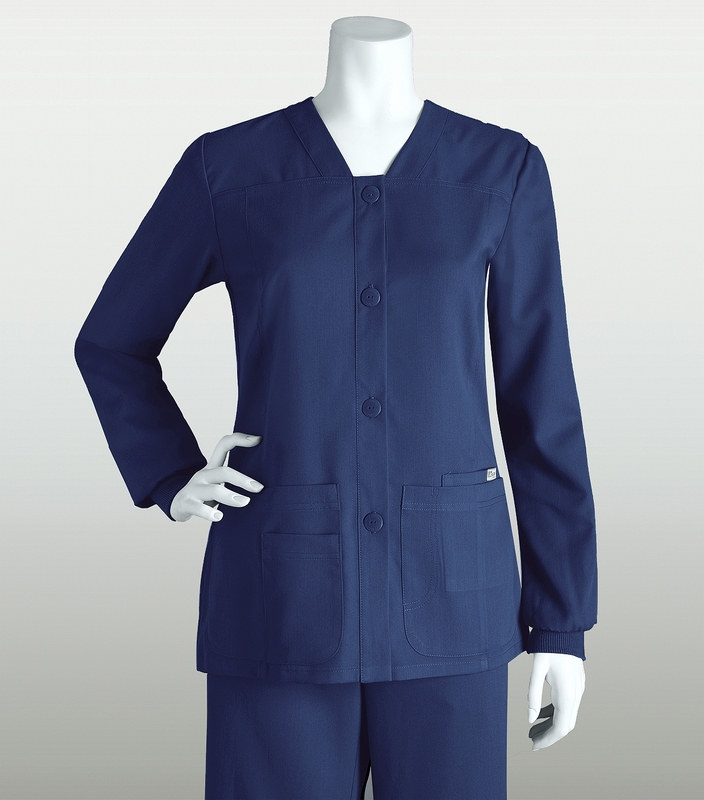 The Grey's Anatomy 4435 warm up jacket is very crafty and highly functional. Made from 77% polyester and 23% rayon with arcLux technology, this scrub will add flair to your wardrobe and a breath of fresh air to your work week. Embrace the modern design of this new sporty feel. You'll also love the words 'Grey's Anatomy' on the buttons! The princess seams allow the top to enhance the curvature of your feminine form and allow you to feel comfortable while you endure the hustle and bustle of your busy shift schedule. Be comfortable and highly efficient while you work. It all begins with a great pair of scrubs. This jacket is by far the cutest I have seen in a while. It fits just right. It is not baggy and it gives you a nice shape without being tight or too short. The neck is also very comfortable. I don't have to fold it over or inward. Great buy. I wear it a lot. Love the fit on this jacket! It's cute and feminine and it's super soft. This lab coat is very affordable and it also looks very professional. I would recommend this lab coat to anyone looking for a quality buy!! Love all the Grey's Anatomy scrub wear. Very comfortable! I really love the fitting and quality of this coat. I wear my coat almost everyday and it still looks like new. I would definitely recommend this coat if you are looking for a good quality lab jacket!! This is a nice warm-up Jacket. Fabric is nice, jacket fits good. I was lucky to get it on 30% sale and I purchased it in two colors. Hope Medical Scrubs Collection will have more sales because I would buy much more!